The winds of Lake Ontario have been most kind to me, coming from the northwest just stout enough to hurry me a long at 5 to 6 knots. The progress is tallying up now but I’m determined to stay in the moment and not agonize over the many miles ahead. The lakes are too delicious to miss a single bite. Tomorrows miles will come soon enough. Long after sunset, I find my way into Oak Orchard Creek. The chart doesn’t show anywhere to anchor, but still I have a feeling about the place and I find it even in the dark. I come in at an idle. Dead slow is not slow enough to take in all the peace of the night. The trees overhang the bank, their shadows long on the water. A frog sings in the undergrowth a low song. I hope the love of his life will hear and come. I step lightly to the bow and as quiet as I can bring out the anchor, but the noise of the chain disturbs even me. Hand over hand I lower it to the bottom putting out just enough line to give the CAP’N room to swing in a breeze I cannot even feel. The frog stops singing but only for a moment then starts again. I become part of the peace. It is a river right out of Wind in the Willows. In the morning Ratty and Mole will come rowing by. A light wind in the right direction is a blessing. The day is passed reading, adjusting sails, mending small holes in the trampoline before they can become big holes. I’m far enough out not even the fishermen come by. The dying winds of sunset leave me drifting. Rather than motor to an anchorage I decide to start doing what will become a regular practice out at sea. I’ll hove to and spend the night on the lake. Checking my position I’m satisfied I’m clear of any shipping lane for Rochester and bring down limp sails. My lights are burning bright. The only waves are the echoes of the dead wind and long gone motorboats. I go to sleep easier than I thought I might and only wake now and again to check the horizon. The sleep is restful and when the thunder wakes me a daybreak, I’m ready for another day. And yes, it is a red sky in the morning. This sailor takes his warning. There is a thunderhead to the west of me and a thunderhead to the southeast of me. I fear lightening. I know to not be touching metal during a storm. I dress for insulation and stay well inside. I turn of all electronics and unplug them. I even put on my mittens lest I touch something I shouldn’t. I watch the mast for Saint Elmo’s fire. I start the motor and head for a spot between the two thunderheads. If I’m struck, what will happen? Will it burn my stays, melt my sail to the boom, kill Betty (my wind-gen), eat my antennas or just plain scare me to death? I had rather not find out. It will not be a matter of luck. Remember, I don’t believe in luck. It will be the results of the physical properties of the boat and the proximity of the storm all coupled with forces I do not understand like static charges and thermodynamics. That doesn’t matter. What matters is that I take any action I can to break the chain of events necessary for lighten to occur and thus decrease that probability. I clip jumper cables to the stays and let them trail in the water. I camouflage myself in order the lightening might overlook me. Actions have consequences. I am the chicken of the sea and I count the seconds between flash and thunder (what’s that old rule, every second is a mile away? I forget) and run for open sky. A hard rain washes the deck, then is gone with the dawn. I have drifted only two miles in my sleep. Toward noon the passing storms leave me with a gift of wonderful north wind and CAP’N LEM sails handsomely on to Oswego. In Oswego Harbor I tie to the river wall just below the locks at Lat.47° 27’ 32.0”N ~ Long. 30’ 34.1”W having traveled 76 nm in two days and 1758 nm to date. 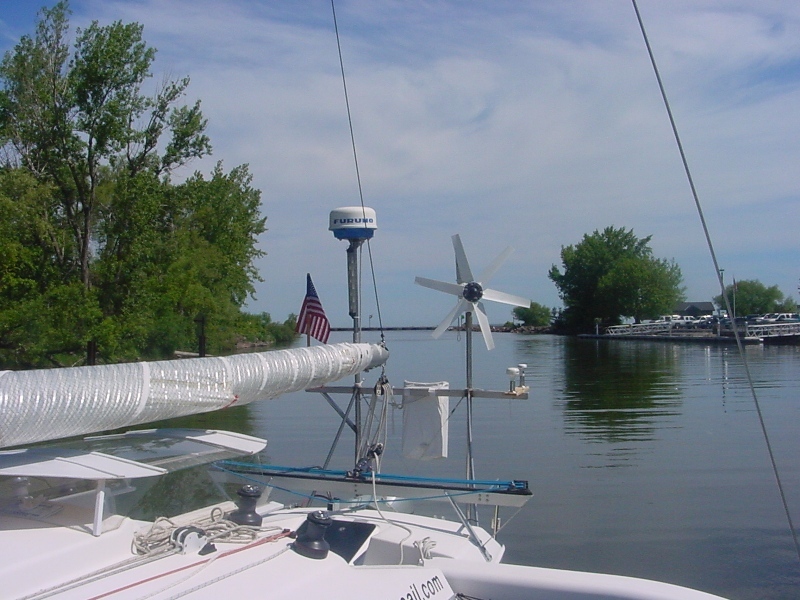 My anchorage in Oak Orchard Creek NY was Lat. 43° 22’ 13.3”N ~ Long. 078° 11’ 33.3”W. This entry was posted on Tuesday, June 16th, 2009 at 10:55 am	and is filed under Lake Ontario. You can follow any responses to this entry through the RSS 2.0 feed. Responses are currently closed, but you can trackback from your own site. I am enjoying your adventure greatly, albeit through the ‘magic’ of my computer screen! Thanks for all the sensory detail as we too live those precious moments. 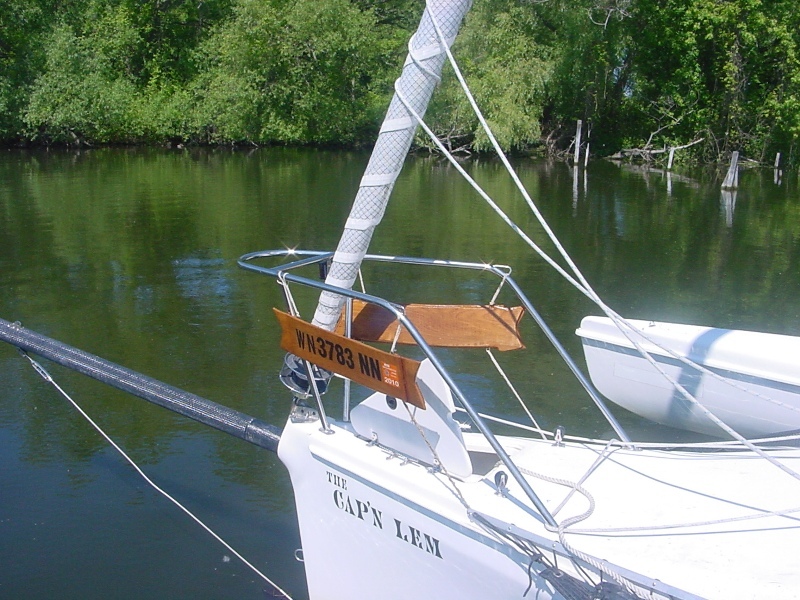 I live on the north shore of Lac St Louis (St. Lawrence River at the confluence of the Outaouais (Ottawa River) Pointe Claire, QC) and am desperately hoping to catch a glimpse of the Cap’n Lem in full sail! Lake Ontario already! Tommy you are swiftly eating up the miles. As always I love reading about your adventures. Here is the google link for your position now. It took a little figuring for me (how to get it punched in correctly) but should be easier the next time. I can post the url links in the comments each time you dock if you like. Opps….I had you somewhere in Canada on Google Earth. Tommy this post is brilliant. Your writing talent is evident; clearly. Seriously, you are a natural philosopher and writer too. So enjoying your post and adventure. Am forwarding hard copy to brother,Buffalo , N. Y. Sailed the great lakes with the Corp of Engineeers, He is enjoying your posts. You are a wonderful writer and very sensitive to the beauty of the area. Port Angeles getting first rain in 29 days, feels good. Town quiet, graduations over. Fair winds and prayers for safety. I hope you saw Ratty and quoted to him, “There is nothing – absolutely nothing – half so much worth doing as simply messing about in boats.” We’re following along and enjoying the ride. Joe and I are in Whitehorse, eagerly awaiting race day. Take care, hold fast, and fair winds.